We love sensory play around here! 2-year-old N is particularly fond of water play, and he and his sister have a ton of fun with it on a regular basis. 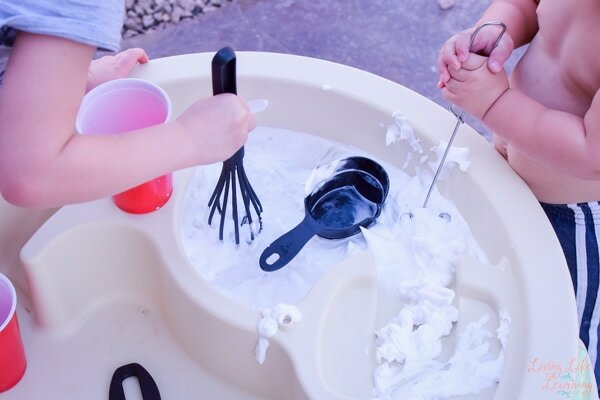 This time, we kept it really simple and added another favorite material to make Shaving Cream Sensory Soup! With just a few simple tools from the kitchen, it kept both siblings entertained for a long time. 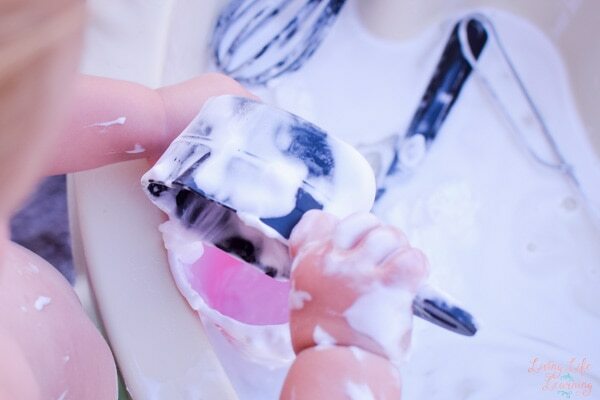 And while it was pretty messy, it was also really easy to clean up, thanks to the shaving cream. 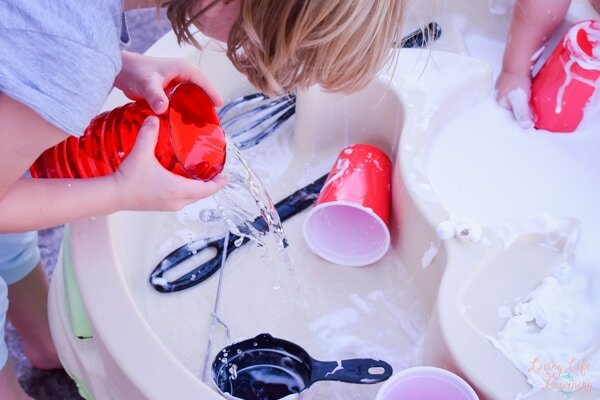 Water table or sensory bin. 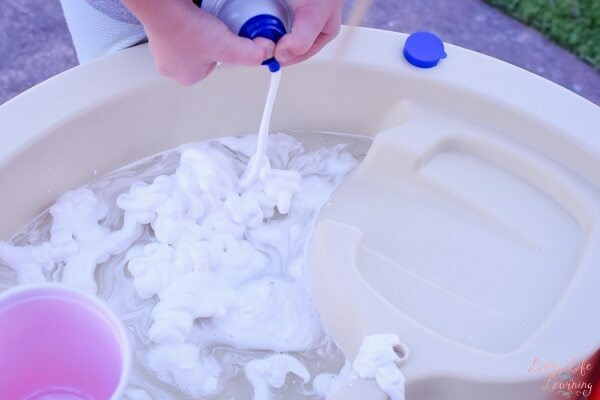 We definitely get a lot of use out of our water table, and it’s one of the best purchases I’ve made for my kids, but a sensory bin works well, too. Kitchen tools, cups, and assorted other items for stirring, scooping, transferring, etc. E helped set up the water table for this activity. After I’d poured some water into the upper compartment, she added shaving cream on top. N particularly liked the frother and spent quite some time exploring it. 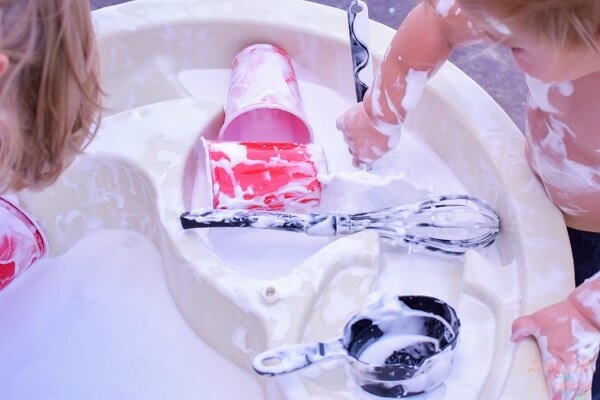 After a while, E decided that there should be more shaving cream sensory soup, and she asked for more water that she poured into the other compartment of the water table before adding the rest of the can of shaving cream. After the stirring, there was a lot of pouring into and out of the different containers that the kids had at their disposal. He immediately asked for a towel but stuck his arms right back in after he’d cleaned himself up 😉 He repeated this process several times and clearly enjoyed himself immensely. 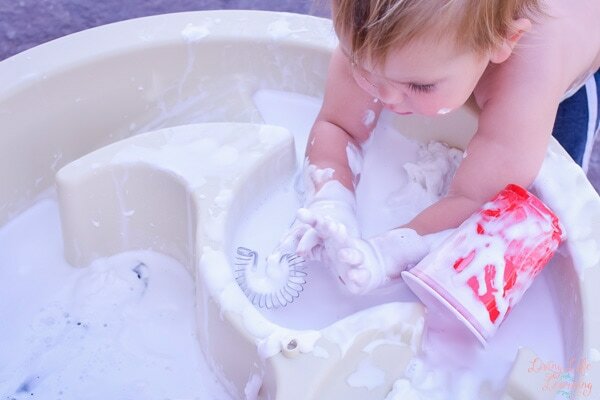 but the shaving cream made it really easy to clean up everything in the end. I love how the kids had this much fun with just two simple materials! 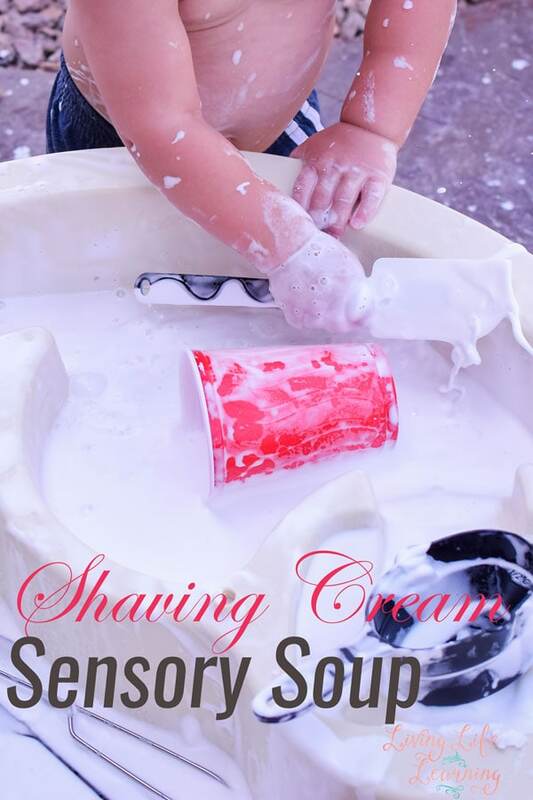 After this Shaving Cream Sensory Soup, try Goopy Grass Sensory Play, Flower Sensory Soup or any of these Activities with Shaving Cream. For a less messy and wet activity, N recommends this Toddler Boredom Buster with Cups and Flowers! Tina has the best ideas!